The record is made up of 1 volume (138 folios). It was created in 1904. It was written in English. The original is part of the British Library: India Office The department of the British Government to which the Government of India reported between 1858 and 1947. The successor to the Court of Directors. Records and Private Papers. SHEER (UMM AL).—Pearl-bank (?) off Ras Laffan. SHIKOH —Inland place between Euairit and Bidaa with fresh spring. Jasim was building fort here in 1886. SMAITH (AL BU).—Tribe at Bidaa (?). No particulars. this misprint for Soudan below ? them the principal inhabitants of Bidaa. Al.mad bin Selman in 1902. Zaluf (?;. 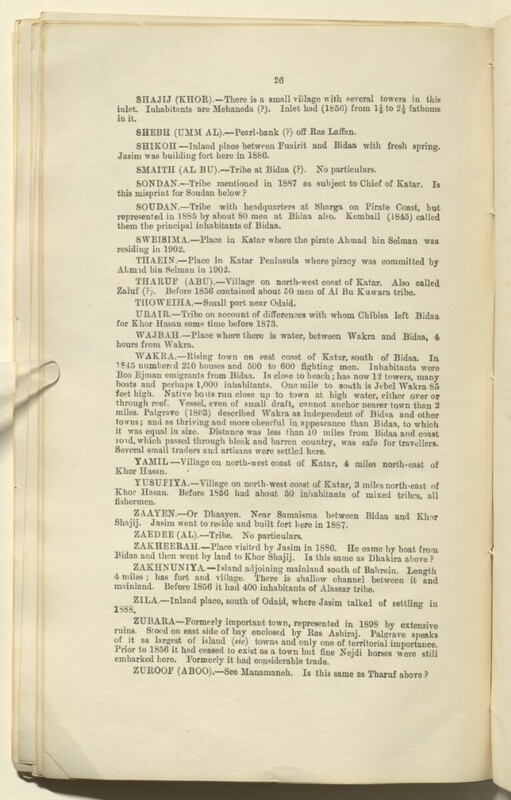 Before 1856 contained about 50 men of A1 Bu Kuwara tribe. for Khor Hasan some time before 1873.
roid, which passed through bleak and barren country, was safe for travellers. Several small traders and artisans were settled here. Bidaa and then went by land to Khor Shajij. Is this same as Dhakira above ? mainland. Before 1856 it had 400 inhabitants of Alassar tribe. embarked here. Formerly it had considerable trade. ZUROOF (ABOO).—See Manamaneh, Is this same as Tharuf above ? Each subsection, organised alphabetically by name, contains a variety of geographical information, including towns and villages, districts, physical geography, tribes and tribal sub-sections, wells, and forts. A list of contents is given on the front cover and folio 3, with reference to the original pagination. Each sub-section is ordered alphabetically. Foliation: the foliation sequence (used for referencing) commences at the front cover with 1, and terminates at the inside back cover with 140; these numbers are written in pencil, are circled, and are located in the top right corner of the recto The front of a sheet of paper or leaf, often abbreviated to 'r'. side of each folio. Pagination: the file also contains an original printed pagination sequence.